Just passing along some delicious news from our friends at St. Nicholas of Tolentine School. Flourish and Talents Flow") is getting ready for its 3rd Annual Taco Night from 6:00 to 8:00 p.m. Friday, May 2 at the school, 3741 West 62nd Street. 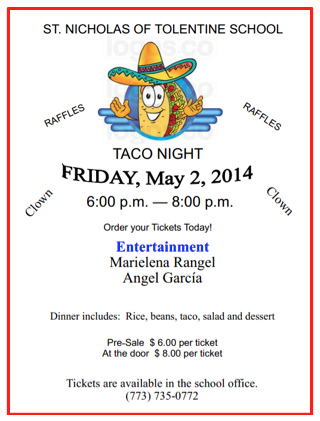 Dinner tickets are $8 each at the door, $6 via pre-sale, and include a dinner of rice, beans, taco, salad and dessert. See the flyer to the right for more details. Parents, parishioners, alumni and all members of the community are invited to take part in the event. 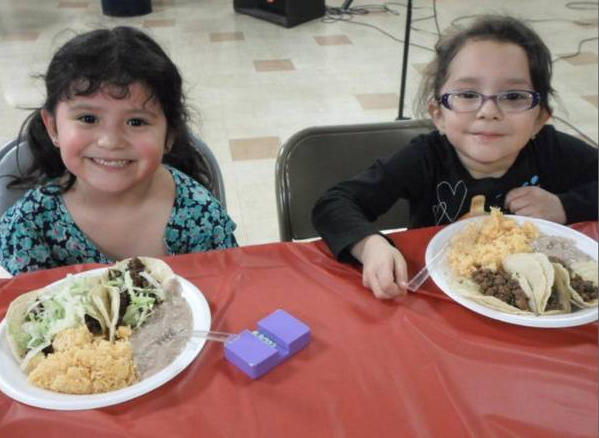 Taco Night helps fund the “Cool the School” air conditioning project for the school. We want to provide the best learning environment for our students. St. Nicholas has decided to go above and beyond our normal operating budget and begin an exciting capital drive to fund air conditioning that will serve all classrooms at our school. The school is in the process of receiving donations and raffle items for the big fundraising night. Taco Night is a delicious, two-hour event hosted at the school from 6:00 to 8:00 p.m. For more information regarding this event or the school, please contact the school office at (773) 735-0772. Easter Bunny Visits Kids on Archer Ave.